I should write a book about how to fake high-end decor! I’ve mastered this skill over decades and it is probably one of the most important design skills you can hone too. Whether your style, formal or farmhouse, refined or rustic learning how to create the illusion of putting beautifully made, expensive things in your home give it a certain polish and grace. And all homes can use that! 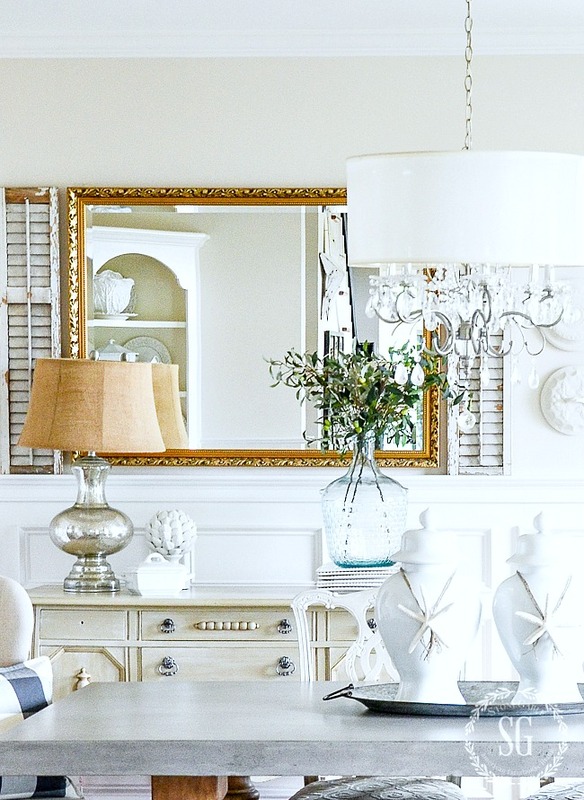 Today, let’s master the art of the great decorating fakeout! I want to highlight a recent Decorating Tips And Tricks podcast HOW TO FAKE HIGH-END DECOR. We’ve gotten such a fabulous response from this episode I thought you might like to listen to it in conjunction with today’s post! And listen to all our podcast on your smartphone or HERE. Let me first say… You don’t need a lot of money to create a high end looking home!!! No, no, no! All you need to know are some design secrets, how to be creative and savvy and how to master some home decor diy’s! 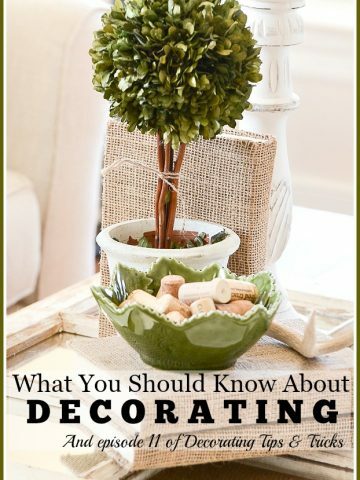 I look at decorating as more of a journey than a 50-yard dash. Give yourself time to curate your look. Very few of us have the budget to put together an entire room all at once! Enjoy the journey! And even if we could decorate a room all at once would it have that beautiful “created over time” look? And that is something to strive for! It’s good to have an overall design look in mind when working on a room but don’t get so stuck on an idea that you are not willing to change things up when one of those fabulous one-of-a-kind finds come your way!! I’ve been working on my dining room for over five years. 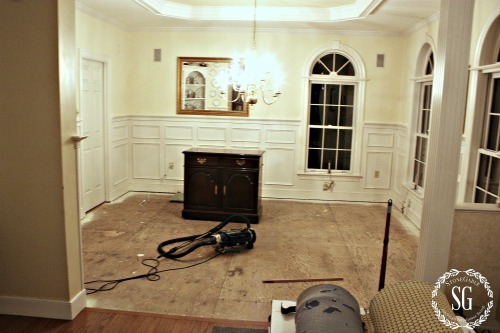 We started by gutting it and adding hardwood floors and repainting it. Our room had great bones but it had needed a makeover for about 5 years! So we started from scratch. The only thing that remains in the dining room today is the mirror and a couple dining room chairs that I repainted and reupholstered. But when we finished the floors and the painting we put all the old dining room furniture back in and replaced one thing at a time! Little by little as our budget allowed I found amazing pieces and we replaced our older things. The first thing I replaced was the chandelier. You can see it HERE. As you can see the chandelier was very very reasonable but I thought it has a high-end look! Is this room done? Are we ever really done? I must say this room has the look I love but there are still a couple tweaks we will be working on this summer. So take your time and enjoy the journey. Collect and curate your look! 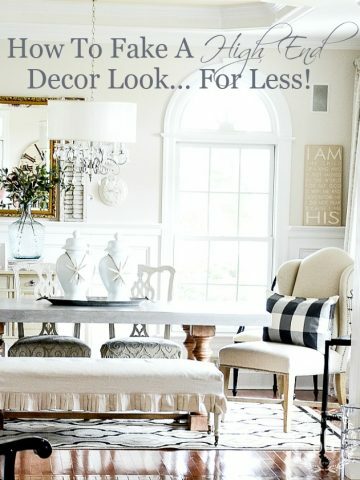 I think this is one decorating tip that will make the most difference in creating a high-end look in your home! Not everything you put into a room needs to have a high price tag! I usually try to be very frugal when creating a room. I’m also not afraid to save my pennies and “splurge” on pieces that will make my room look amazing. In my dining room, the table and pillow covers were my splurges! I found this table at Birch Lane and as far as the table goes it was very reasonable. You can see it HERE. Unfortunately, the pillows are no longer in stock. I think there is an art in putting a room that looks high end on an everyday budget. And that takes practice! 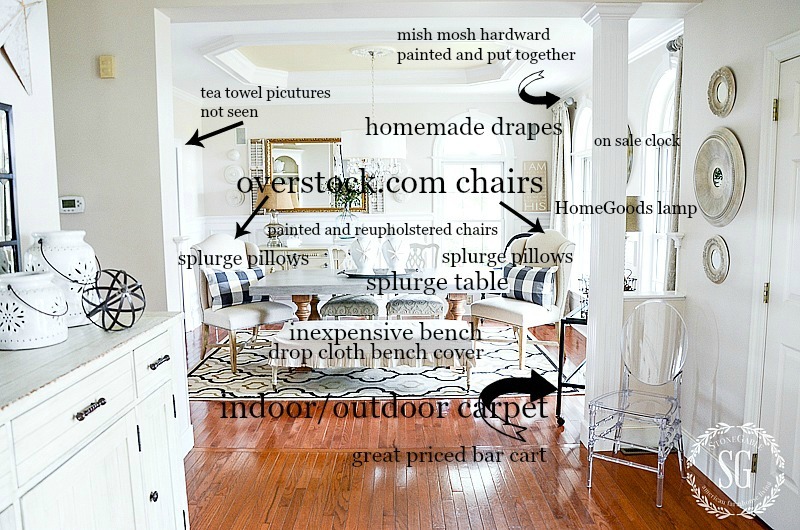 Train your decorative eye by pulling apart rooms from your favorite blogs, Pinterest, and magazines! When I was right out of college I worked as a bank teller for a summer. I went to a two week training and learned the ropes of working in a bank. One thing I learned stuck with me and I find it very transferable and useful in decorating my home. To spot a counterfeit bill we studied and studied what real money looked like. There are some tale-tell signs that mark real money and are very hard to copy. I think it is a very good idea to look at home furnishings the same way. Learn what the real thing looks like! And take those high-end elements and look for them in a more reasonable piece! 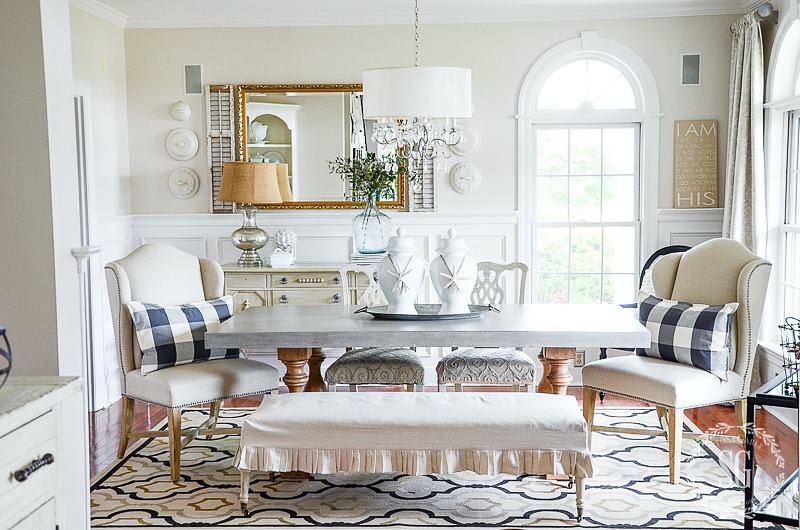 Do you love Bergere chairs? Know what a real one looks like. There are so so many knock-offs you can find today for fabulous prices. You might not necessarily want a “shepherdess chair” from the 1700’s but you probably want a Bergere with a high-end look. Study the turn of the legs, the carving on the wood, the wide padded seat and every wonderful thing about this comfy french chair! The mirror that hangs in my dining room was taken from the master bath of our second home. It was a pretty big splurge but I knew that I would have it in my homes and that decision really as paid off! It has lived with us since I was a young mother! And I have never tired of it! I went to a very reputable frame maker when I was considering a mirror and had a lesson in how mirrors were gilding. I also learned how to guild myself. A very interesting and easier than it sounds process. Although this frame was not really gilded is does have the “look”. So I had the frame built and a mirror fit to its size. Now when I’m looking for mirrors that have that gilded look I know what to look for. Keeping a color palette tight is a great way to create a high-end look even when your style is not necessarily high end! That’s one reason I love love love neutrals! 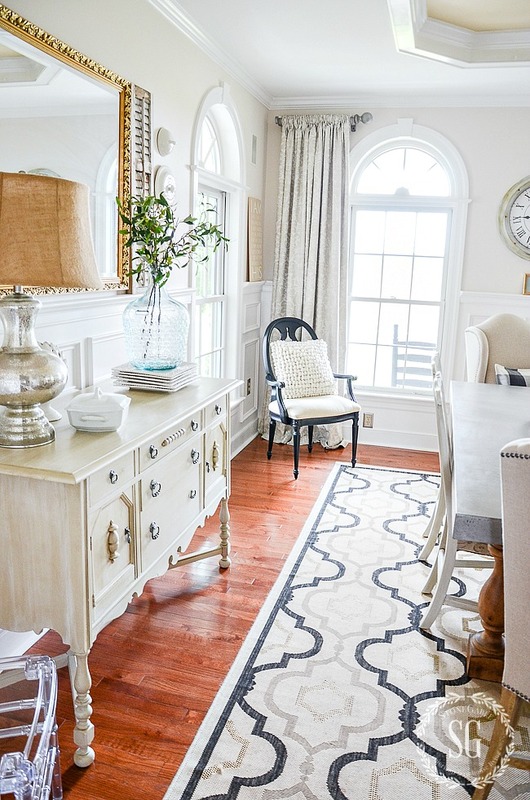 Even though the colors I use in my dining room are mostly neutrals they really vary quite a bit. There are whites, tans, taupes, gold, silver, flax, black and just a tad of muted aqua. But when put together with lots of texture they all play nicely and create a high-end look. Also, think about limiting the patterns and motifs you work with in a room. Opt for great textures instead. Adding different textures to a room really make a room look interesting and inviting! Whatever your style, adding something that is exquisitely made or has wonderful lines from a bygone day will give your whole room a high-end look! 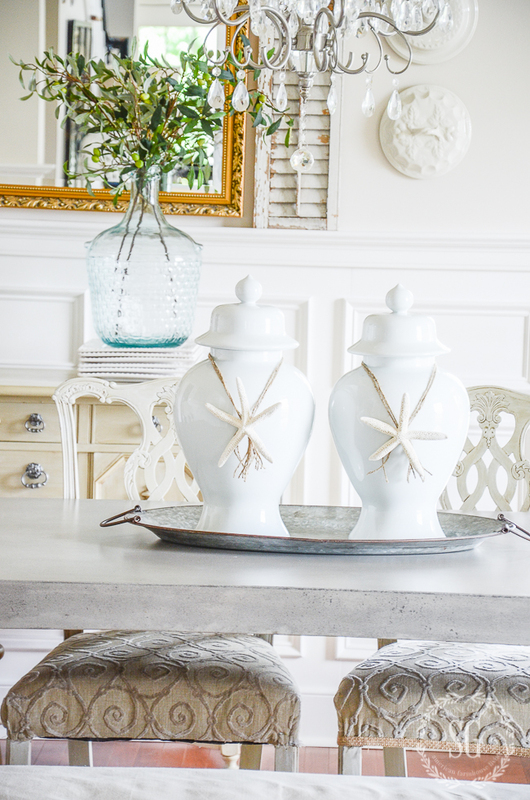 Something as small as these white ginger jars that create a centerpiece on my table helps to elevate my room’s look. They are old and swoon worthy and they are a perfect representation of ginger jars made 50+ years ago! When I saw these my jaw dropped because I knew they would add an expensive vintage feel to my dining room! And I purchased them for a song! Score! Don’t you love finding gems like these? There are so many more things we can do to fake a high-end look that won’t cost us much money at all! Paint and Upholster- Learn how to paint furniture and upholstered chair seats. There are tons of videos on youtube to help you! One of my favorite videos are from Amy Howard At Home. Sell your old furnishings. Get things you don’t need or want anymore into a consignment shop or sell them on Craig’s list etc. You can make a little money to reinvest into your home! Hang curtains high- a real designer look! Edit your collections- Nothing ruins a high-end look like a bunch of little collectibles hanging around. If you love collectibles then, by all means, display them but only a few at a time. Rotate them and group them together. Go bigger- Use bigger accent pieces and fewer of them. 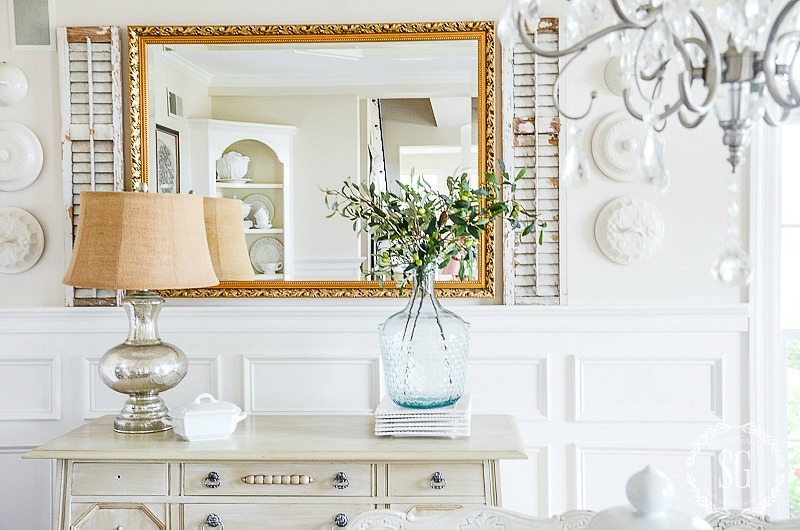 High end looks often opt for gorgeous large statement pieces! Hang art- Go bigger with art and mirrors! Bigger is definitely better! Getting a high end look no matter what your style is easier than you think! It just takes time, a plan, knowing what quality looks like and attention to color and patterns. Now, what room do you want to give a little spit and polish to? Go ahead and make it a high-end beauty! Thanks for the inspiration-great practical ideas! Your sense of style is amazing. 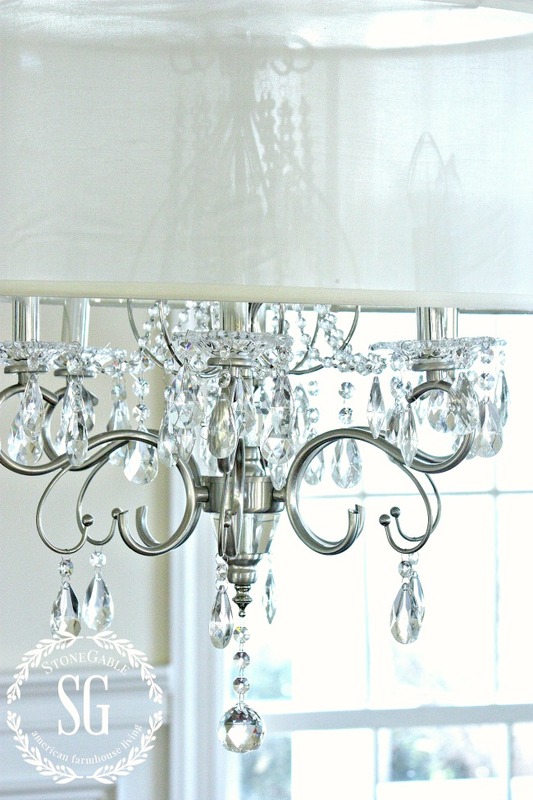 I just love what you did with the chandelier. Great ideas! Keep them coming please! Always enjoy looking at your house. I see something new each time. Thank for sharing it with all of us again. You never cease to amaze me!!! I love your style. Thank you for inspiring me. Hi Yvonne! I was wondering what color is on the walls in the dining room? I love the subtle difference from the trim. I’m sure you’ve mentioned it in another post. . .I just can’t recall. Thanks! All of these are great tips that I will definitely keep in mind; thanks! YESSSSSSSSS!!!! I have always believed the best designed rooms are ones that evolve over time. I have learned to be VERY patient and have found some real gems at thrift stores, auctions, and craigslist. If you are looking for vintage and antiques you must go to the fair at Hillsville Virginia. Is done on Memorial Weekend every year. Is the biggest flea market in the US. Make sure you are ready to walk. Look in YouTube so you can see the prior years of the fair. You will find everything. Okay, I’m just gonna say it! When is that book coming out? 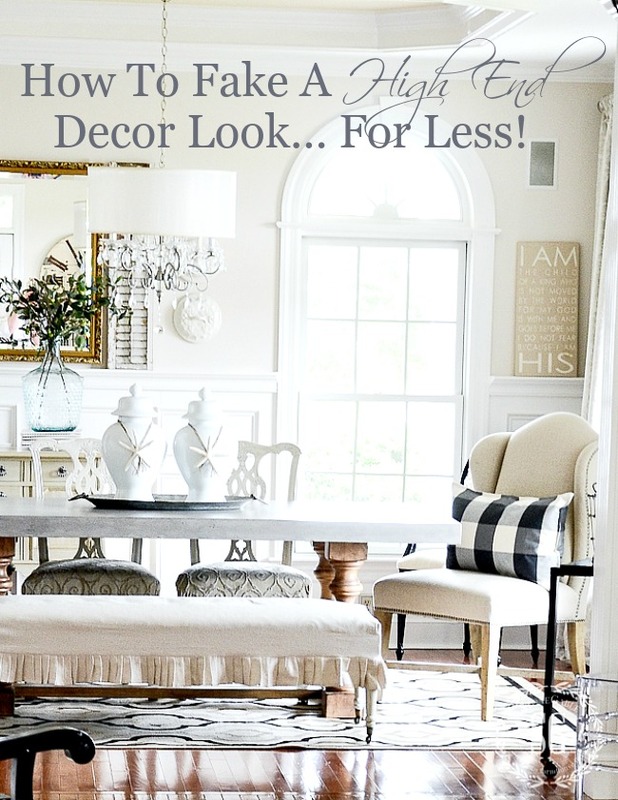 How to fake a high end decor look for less. I will be the first to purchase it. I love your ideas. I’ve followed your blog for a few years and my home looks so much better thanks to your advice. I so appreciate you being vulnerable and sharing your intimate home spaces with us. Thank you from the bottom of my heart. I have definitely been blessed by you. The white ginger jars-I didn’t know that’s what they are called. I will definitely be on the lookout for some of those, love them! You’ve inspired me to take a second look at my dining room, Yvonne. I have a lot of vintage teak which I am very tired of looking at, but perhaps I can sell it which would enable me to buy something different. Much to think about. I would love finding gems like those! Fabulous! Really, really good advice and tips. I LOVE those ginger jars also. In fact, I have a pair ever so similar but in blue and white chinoiserie. Putting yours as table decor was genius! PS ~ I’m amazed at the reasonable price of your dining room table! Love being able to comment without reading everyone’s post! I absolutely LOVE finding inexpensive pieces to mix with. 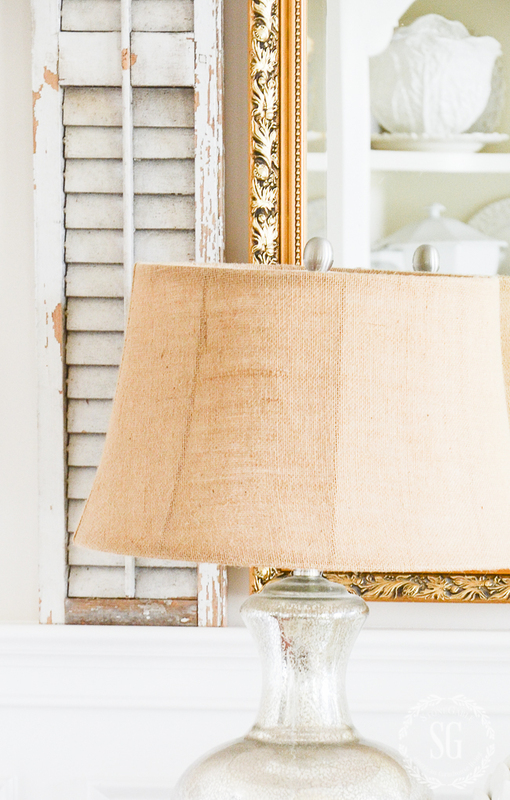 I’ve found the best lamps at ridiculous sale prices at Hobby Lobby and no one’s the wiser ~ at least until they read this post!! 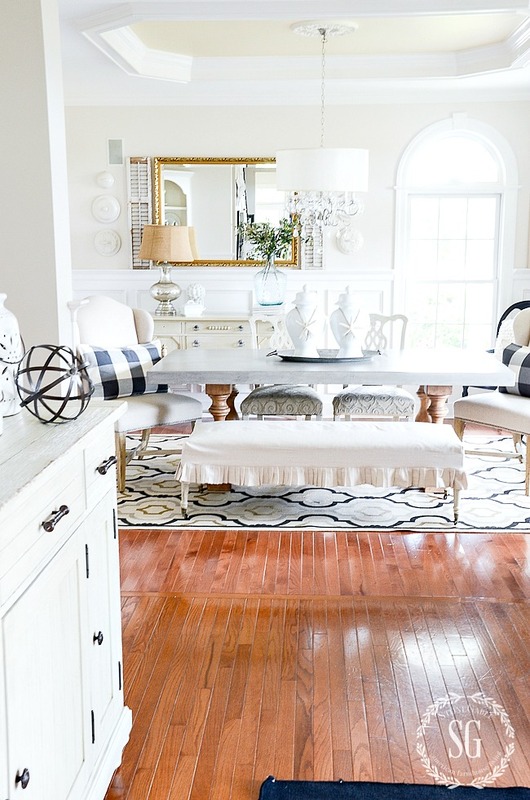 These are great ideas I love your dining room and I appreciate you sharing your sources for your decor. I enjoyed this post and the podcast. Many of us are working to decorate on a budget. I have two boys in college at the same time (twins). So high end stuff not in the budget. I look for bargains and do paint stuff. Thank you for all of the tips. Thank you for showing your readers how to fake the high end look on a budget. I can’t wait to get started with the tips. Thanks again! Yvonne, is there a problem with today’s podcast? The last one I can access is Friday’s broadcast, and I certainly do not want to miss one!!! 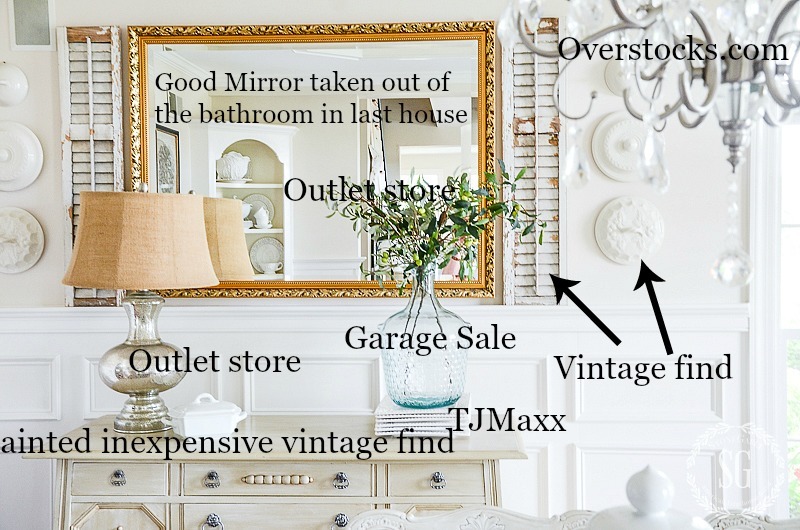 I love your ideas of mixing old and new, yard sale and high end expensive items. Visitors that come in to my house never know most everything is a hand me down estate sales etc. I love to play with decorating. I dare say, I do a bit everyday. Keep giving me those great ideas, I love them. No wonder you are such a good decorator! “Playing a little every day reallly helps”! Your rooms always look so put together. I enjoy when you tell where things are purchased. It helps when shopping in those stores. Great tips- I wish I had known them 30 years ago but better late than never! I’m purging all the extra stuff and will keep this in mind for what I keep/get rid of. My main issue is limiting things; I tend to be all over the place. I’m learning though. ha. Cecilia, I wish I knew these tips 30 years ago too! But we know them now!!!! Wonderful information, thanks! 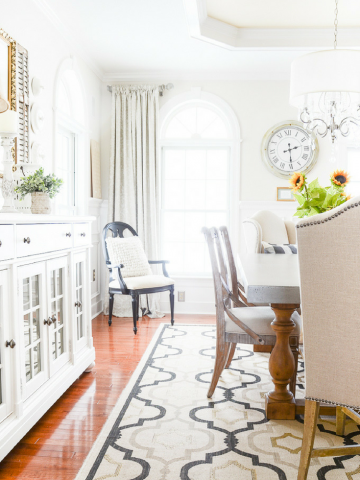 Curious where your dining rug was purchased? 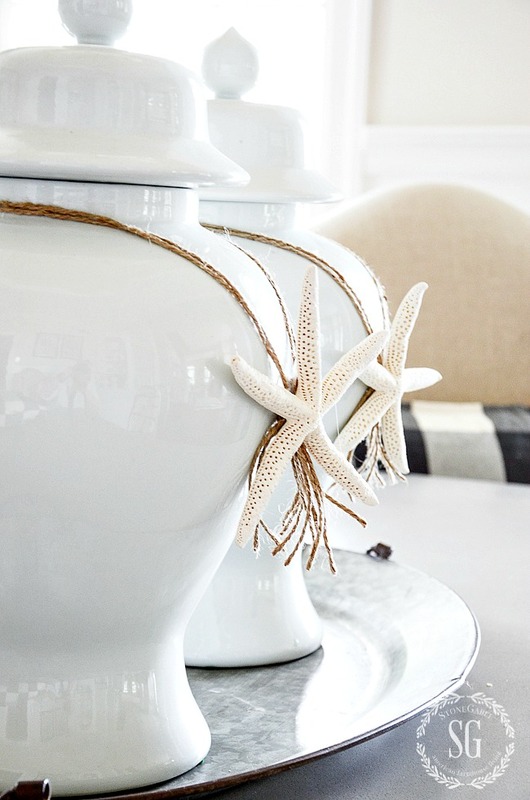 Love your tips for decorating! You always give me little nuggets of inspiration that I try to apply to our home! Have a great day! What room do I want to add polish to?? How about most of them!! I am slowly working toward that goal–a process for sure!! Thanks for the great advice!! Thanks for sharing and inspiring. Love what you have done. It is great to hear that you also decorate with a budget. Enjoy your Monday. Love your thoughts and advice. Will certainly put some to use. I love this post! So much useful information. Thank you for sharing your secrets with us! And, yes – you should write a book!!! You make so many great points, Yvonne. Years ago I started reading “high end” decor magazines, even though the look was often different from my own vision, but they really helped train my eye. I also started going bigger with accessories and more neutral with color. I’m still a real bargain hunter but I think the “look” is much better. Thanks for all your great ideas! Hi Marjorie! Your question would make the most wonderful post! 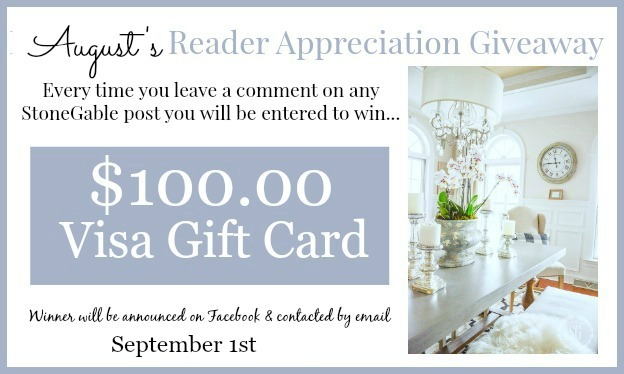 I’ll answer BOTH questions in blog posts in the next couple weeks! Thanks for the inspiration! Great information! Thanks so much for taking the time to enlighten us!